(Above) Eight-year-old Bostin Wistey tips his hat after a successful bull ride. -Submitted photo. 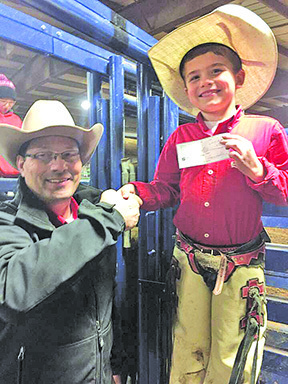 Paul Gagnon congratulates his grandson, Bostin Wistey, after the youngster earned a check for his bull riding prowess.-Submitted photo. Some boys dream of becoming a cowboy. Eight-year-old Bostin Wistey is already living the dream. It was almost two years ago that Bostin approached his grandpa, Paul Gagnon, and told him he wanted to ride bulls. Although a cowboy at heart himself, even Paul had to admit it didn’t seem like a good idea. “I suggested ‘mutton busting’ (a popular rodeo event where youngsters try to ride a sheep) would be a good start,” said Paul. Bostin declared he was “not gonna ride no goats.” He wanted to be a cowboy who rides bulls. Even though his head said no, Paul’s own cowboy heart agreed to look into junior bull riding. A little research revealed that there was a rodeo circuit based in Fort Dodge. Tuff-N-Nuff, run by Johnny Hopkins, is the largest miniature rodeo association in the United States and Johnny is always excited to introduce youngsters to the sport of bull riding. Bostin fell off. But it was just as much fun as he imagined. He was hooked. Grandpa, too. Paul helped Bostin get outfitted with the safety vest, helmet, chaps, spurs, gloves, boots and rope, along with anything else a cowboy might need. 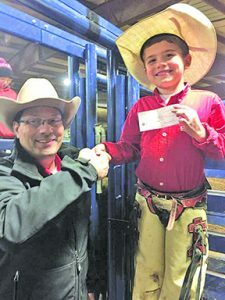 He learned to ride with Johnny’s guidance, practicing his form and balance on a drop barrel, and finally competing on the junior rodeo circuit. This winter Bostin competed in about a dozen rodeos and even earned a few paychecks for his efforts.